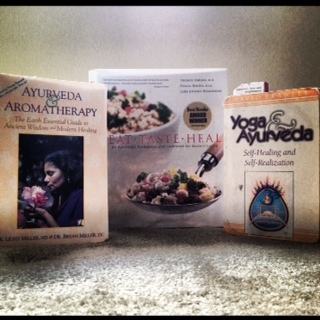 Here is a list o f the Ayurveda books I find myself recommending the most. They are in no particular order and each have a brief review. I have also found that every Ayurveda book has an intro to the Doshas, it is definitely worth the time to read this section even if you feel fairly knowledgeable about the Doshas. It seems that everyone is written with a slightly different focus or view-point. 1. Eat Taste Heal an Ayurvedic Guidebook and Cookbook for Modern Living by Thomas Yarema, M.D., Daniel Rhoda, D.A.S., and Chef Johnny Brannigan This book has a great intro. to Ayurveda focusing on Doshas and taste. The rest of the book is filled with more modern recipes that have different options for different Doshas. 2. Ayurveda the Science of Self-Healing by Dr. Vasant Lad This book is a wonderful introduction to Ayurveda covering a wide span of topics in an easy to understand format. Perfect for anyone wanting to know more than just the meaning of the Doshas. 3. Balance your Hormones, Balance your Life: Achieving Optimal Health and Welness through Ayurveda, Chinese Medicine and Western Science by Dr. Claudia Welch, MSOM I feel this book should be in every womans library. This book is clear and simple to understand and delves into a lot of topics on women’s health, and shows you that you do not have to suffer there are natural ways to work with your body to find health. 4. Yoga and Ayurveda Self Healing and Self Realization by Dr. David Frawley This book covers a lot of Ayurveda and Yoga information, you may want some previous knowledge on the subject before diving in or make sure to start from the beginning as the book builds on itself. I remember trying to read this book before going to CCA. Having studied the subject for a while on my own I thought I knew a lot and that this book would be a walk in the park, it proved me wrong. Dr. David Frawley (Vamadeva Shastri) is considered a Saint in India and has great knowledge of the Vedic texts and shares this in his books. Another book that I would recommend by this Author if you are interested in the subject area is Neti: Healing Secrets of Yoga and Ayurveda. 5. Ayurveda and Aromatherapy (The Earth Essential Guide to Ancient Wisdom and Modern Healing) by Dr. Light Miller, ND and Dr. Bryan Miller,DC I love this book it covers some of my favorite topics all in one book: Ayurveda, Marma Points and Essential Oils. The essential oil guide is a great reference tool sharing the effects on the Doshas and great information on the oils themselves. All of these books are based on Ayurveda with different subject focuses I hope you find one that interests you. I invite you to take some time out of your day and enjoy one of these great books sitting out under the shade of a tree.